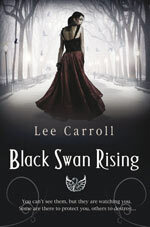 Being surrounded by all varieties of undead, changeling and preternatural beings has gotten to be nothing out of the ordinary for Louisiana cocktail waitress Sookie Stackhouse. Still even she has her limits. Betrayed by her long time vampire love, Sookie must now not only deal with a possible new man in her life - the oh-so handsome shapeshifter Quinn - but also contend with the long-planned vampire summit in Rhodes. The summit, which has attracted undead power players from all over the central U.S., is sure to be a tense situation. The vampire queen of Louisiana is in a precarious position, her power base weakened by hurricane damage to New Orleans. And there are some vamps who would like to finish what nature started. With secret alliances and backroom deals the order of the day – and night - Sookie must decide what side she'll stand with. And her choice may mean the difference between survival and all-out catastrophe…. 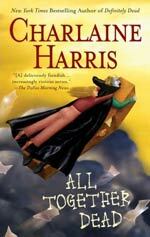 All Together Dead is the seventh book in Charlaine Harris’s popular Southern Vampire series, which follows the adventures of telepath and cocktail waitress Sookie Stackhouse. If you haven’t read any of these books before I recommend that you don’t start with this one but treat yourself (you’ll be glad you did!) and read them in order. Charlaine Harris is an author at the top of her game. She had written many popular novels in the crime/mystery genre before moving into the fantasy genre and even now, seven books into the Southern Vampire series her writing craft still shines through. In the Sookie Stackhouse books, the author has managed to combine the best elements of mystery writing with an imaginative fantasy world, where vampires exist along side of humans with shapeshifters, fairies, weres, demons and a whole host of other mythical and magical creatures hiding in the shadows. All Together Dead is everything that Charlaine Harris’s readers have come to expect, a tightly plotted supernatural mystery populated with engaging characters of both the human and preternatural variety. All Together Dead covers Sookie’s adventures at the vampire summit in Rhodes (this is Rhodes near Chicago not Rhodes in Greece.) Sookie has a complex and sometimes uncomfortable relationship with the vampires in her life. She has been left with little choice but to work for the vampire Queen of Louisiana even though the Queen and the vampires in her entourage frighten Sookie greatly. Although all vampires are untrustworthy and uncaring towards humans, Sookie has managed to find some vampires who seem to genuinely care for her. There is Bill her ex-lover who still appears to want to get back with Sookie even though he behaved in an unforgivable manner towards her when they were lovers and there is Eric, who she had a brief fling with (but he can’t remember it - much to his chagrin.) Eric is irrepressible and although he is obviously selfish and only interested in himself he can’t get Sookie out of his mind. Sookie is conflicted about Eric, she knows that he is selfish and sneaky but she seems to end up more entangled with him no matter how hard she tries to avoid it. When you add Quinn, Sookie’s new man (a weretiger) into the mix you have a recipe for an emotional disaster when you realise that they are all attending the same summit and will be in close proximity with each other for several days. These complex relationships would be enough to fill the pages of All Together Dead by themselves but when you add several entwined mystery plot lines - some murders, a bomb and a group of religious fanatics who think that vampires are devil spawn - you have the recipe for a thrilling read. The last forty pages of All Together Dead are gripping and completely compelling reading. I don’t want to spoil the plot for readers who haven’t yet read the book so I can’t say much more than that - but the mystery is unravelled and the surprises don’t stop until the very last page of the novel. Even though the fantasy world of Sookie Stackhouse is make-believe the author has managed to seamlessly weave in current events, such as the aftermath of Hurricane Katrina and terrorism into that world giving it a realistic edge. On a side note, the Sookie Stackhouse books are being made into a HBO TV series called True Blood. If the TV series is half as good as the books it should be well worth watching. Fingers crossed! Thrilling and fangtastic – All Together Dead is highly recommended reading. You can read the first chapter of Charlaine Harris’s new Sookie Stackhouse book at her website. Visit Charlaine’s site.